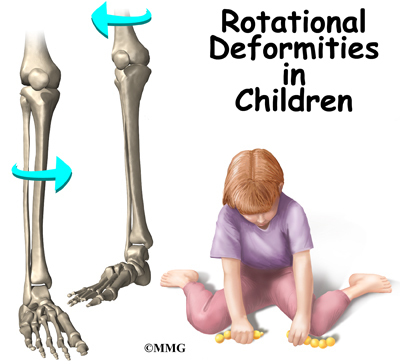 Rotational deformities of the legs and feet in children are often a cause of concern for parents. Most people think of the deformities as either toeing in or toeing out. The deformity actually comes from rotation of the femur and the tibia. Rotation of the legs at birth is normal. Most of the time, the deformities correct themselves by age seven or eight. Rotational deformities are usually due to position and pressure in the uterus during pregnancy. It is important to determine if the deformity is from this, or from something more serious - like a neurological problem. The two main long bones of the leg are the femur and the tibia. The femur is the bone of the upper leg or thigh. The tibia is the larger bone in the lower leg. The front part of the tibia forms the shinbone. 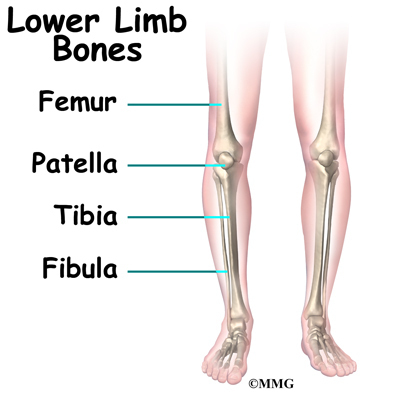 The smaller lower leg bone is called the fibula. Excessive rotation (also called torsion) of the femur and/or tibia will cause the foot to appear to either toe in or toe out. The anatomy of the hip also affects the rotation of the entire leg. The femoral shaft, or thigh bone, attaches to the femoral neck near the hip joint. The femoral neck in turn attaches to the femoral head, the round ball that actually fits into the hip socket. How the femoral neck attaches to the femoral shaft affects how the entire leg lines up with the body. There are two angles between the femoral shaft and the femoral neck that are important. Looking at the front of the body, there is an angle formed where the femoral neck joins the femoral shaft. Looking at the shaft of the femur from the top (along the axis of the femoral shaft), there is also an angle formed between the knee joint and the femoral neck. Doctors call this angle the version of the femoral neck. If the angle is more to the front (anterior) it is called anteversion and if it is more to the back (posterior) it is called retroversion. Normally the version of the hip in the adult is about 15 degrees anteversion. Version can be difficult to understand - even for physicians. But remember, the end result is that too much or too little anteversion will make the entire leg look like it is twisted - either the toes turn in or they turn out. Too much femoral anteversion and the toes turn in; too little and they turn out. The vast majority of rotational deformities that are seen in children - and worry their parents and grandparents - are normal variations that will improve with time. The infant skeleton is made up of mostly cartilage. 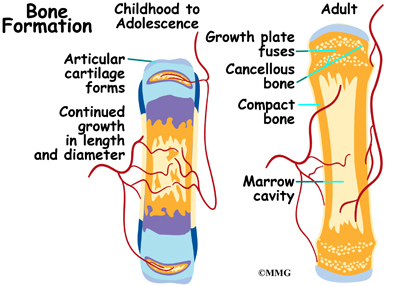 It is immature bone. It has not been calcified. This makes it fairly flexible. Babies are packed inside the uterus tightly. This affects the how our legs look when we are born. Immediately at birth, changes begin to take place. Throughout childhood, the femur and tibia (and the version of the hip) will continue to change and move towards what is normal for the adult. Rotation of the legs at birth is not abnormal. The infant skeleton is made up of mostly cartilage. It is immature bone. It has not been calcified. This makes the infant skeleton fairly flexible. Position and compression in the uterus can shape the cartilage. Most fetuses are in a crossed-leg position in the uterus. There are usually contractures (tightness of certain soft tissues and ligaments) in the hip and knee joints at birth. This also comes from positioning in the uterus. This can be a part of the cause of these various deformities. Positions for sleeping and play may also help shape the various deformities. Sometimes the rotation at birth is excessive. Five in 10,000 children born will have rotational deformities of the legs. The most common cause is position and pressure in the uterus. An unstretched uterus in a first pregnancy causes greater pressure. This makes the first-born child more prone to rotational deformities. The unborn child grows a lot during the last 10 weeks. The compression or pressure in the uterus increases. Premature infants have less rotational deformities than full-term infants. This is possibly due to decreased pressure in the uterus. Twins tend to be crowded in the uterus. They are more likely to have rotational deformities. Sometimes, what is thought to be a rotational deformity is something different. Bowed legs are not necessarily considered a rotational deformity. When rotation is not involved the deformity is called an angular deformity. What looks like bowing of the lower leg can actually be caused by internal rotation of the tibia (lower leg). Because of this, the calf muscles lie on the outside of the leg instead of in the back of the leg. This gives the leg a bowed appearance. Rotational deformities are most often painless. 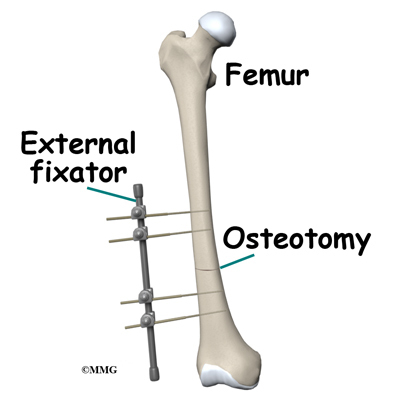 The exception is with exaggerated femoral internal torsion (or femoral anteversion). Some teenagers with exaggerated femoral internal torsion may develop pain in the front of the knee. Climbing stairs usually aggravates this. Rotational deformities normally do not cause problems in adulthood. Children with internal femoral torsion may have a habit of sitting in a W position, or on their feet, rather than crossed legged. Some children will trip over their feet if they toe in excessively. There is not a delay in the normal development of sitting, crawling, and walking. Your doctor will want to take a medical history. He/she may ask about the pregnancy, labor, and delivery of your child. Your doctor will need to know when the deformity was first noticed. Some are noticed right after birth. Some are noticed when the child starts to stand or walk. Some are not noticed until after age three. Your doctor will also want to know if it has gotten worse or better over time. Your doctor will want to examine your childâs legs while your child is in different positions. If your child walks, he will want to watch him/her walk. Your childâs doctor will likely want to feel range of motion of the joints, to see if deformities can be corrected. The legs of the parents may also be examined to see if there is a similar deformity in adulthood. Your childâs doctor may want to perform a neurological examination as well. This is to make sure there are no symptoms of cerebral palsy, or muscle disease that could be causing the deformity. The diagnosis of rotational deformity is usually made by the findings of the physical examination. X-rays or other imaging is rarely needed. 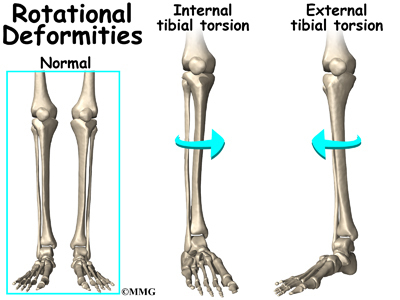 Internal tibial torsion (ITT) is the most common of the rotational deformities. It causes toeing in. It is usually noticed at birth or early infancy. Your child being cross-legged during growth in the uterus causes it. It often goes unnoticed until your child begins walking. The deformity is more obvious when standing. It usually goes away by age two or three. If internal tibial torsion is significant, and lasts past the age of five, surgery to derotate the tibia may be necessary, although this is very rare. External tibial torsion (ETT) causes toeing out. While the child is in the uterus, the foot is held in extreme dorsiflexion. This means that the top of the foot lies against the shin of the same leg. This causes the foot to be in an externally (outward) rotated position. When your child stands, the foot will appear to toe out. 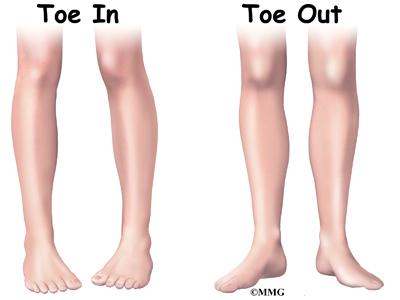 Internal femoral torsion (IFT) is the most common cause of toeing in after age three. If the tibia and femur are both internally rotated, toeing in may be even worse. This occurs more often in girls than boys. IFT can be diagnosed by comparing internal and external rotation range of motion of the hip. Your child will be placed on their stomach with knees bent. Normal children have equal amounts of internal and external rotation. In children with IFT there is an increase in the amount of internal hip rotation (torsion). 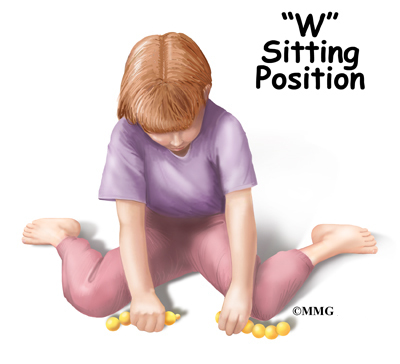 Children with internal femoral torsion will want to sit in a "W" position, or on their feet, rather than crossed legged. External femoral torsion (EFT) is much less common. This is because the usual position in the uterus makes the femur rotate internally, not externally. External femoral torsion can also be a cause of toeing out. A significant difference between the left and right leg may mean that a deformity is caused by something else. Tumors, abnormal bone formation, fracture, and infection of the bone are possible causes. Excessive toeing out of one foot can be a sign of hip disease. Further evaluation is necessary. A child with progressive bowed legs after 20 months may have a pathological deformity known as Blountâs disease. Rickets can also cause bowed or knocked knees. Rickets is a vitamin D deficiency. It is also seen in kidney problems. Neurological and muscular disorders can also cause deformities of the legs. The vast majority of children with rotational deformities need no specific treatment. The rotational deformity will change towards normal with time. Letting Mother Nature work things out is usually the best course of action. Sculpting of the body is a natural process. It includes the muscles, ligaments, and bones. Genetics also play a part. Muscle pull, lifting against gravity, and learning new postures all help with the normal development of the skeleton. If your child's foot looks normal when not weight bearing, then most likely no treatment is needed. Bracing or orthotics is not needed. 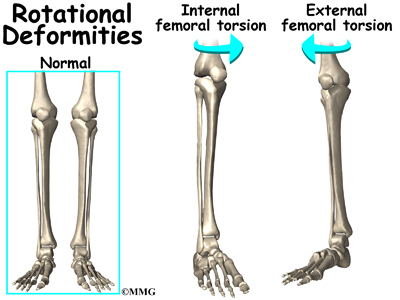 External femoral torsion is much less common. Usually no specific treatment is necessary. Splints, orthotics, and corrective shoes are not usually beneficial. Braces, casts, twister cables, exercises, and orthopedic shoes have been used to treat rotational deformities. Some studies show they may not be all that helpful. Their results are similar to no treatment at all. Stretching exercises, and encouraging certain positions for sleep and play cause no harm. But understand that these interventions may just make parents feel good that they are doing something for their child. Parents should consider the psychological effects of any type of rigid, disciplined program that restricts the child's ability to interact normally with their surroundings. Rotational deformities generally do not cause problems in adulthood. Many parents worry that these problems may cause arthritis in the joints when the child is grown. This is highly unlikely. Surgery is rarely needed to correct the majority of rotational deformities in either the femur or tibia. If external tibial torsion (rotation) is very severe and lasts longer than age four, surgery may be recommended to better align the tibia. Similarly, if surgery on the femur is recommended, it is usually done after the age of eight. Surgery to correct the deformity is done only when the deformity is severe and affects the child's function. In general, the type of surgery performed to improve the rotational deformity is called a derotational osteotomy. Derotation means to remove the rotation and osteotomy means to cut the bone. A derotational osteotomy requires the surgeon to cut the bone, rotate it to improve the alignment and hold the bones in that positon while they heal. Some type of metal hardware is generally used to hold the bones in place until they heal. The younger the child, the faster they heal. 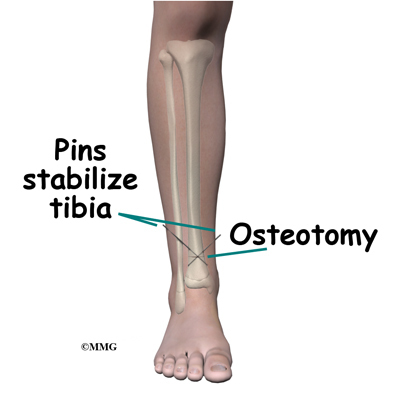 When the tibia is involved an osteotomy just below the knee or just above the ankle can be done and held in place with one or two metal pins through the skin. These pins can be easily removed in four to six weeks once the bone has healed. In the older child, a metal plate and screws attached on the outside of the bone or metal rod placed inside the marrow cavity of the tibia may be necessary to provide support for the longer period of time necessary for healing. When surgery is recommended to derotate the femur, the intramedullary rod is commonly used to hold the bone in place. Children who require this surgery are generally older. A stronger type of fixation is required for a longer period of time. The intramedullary rod is placed through a small incision in the over the hip and the patient can be up and walking nearly immediately. The rod does not necessarily need to be removed in the older adolescent child. If the child is younger and the growth plates of the femur are still open, other fixation may need to be considered so there is no damage to the growth plates. Another option is an external fixator. This device uses metal pins that are placed through the skin and into the bone. They are placed above and below the cut in the bone. The pins are then connected to bars on the outside of the leg that hold the bones in place while they heal. The pins are removed at a later date (usually four to eight weeks) when the surgeon feels the bone is strong enough. Pin removal can easily be done in day surgery. This can be safer when the growth plates are still open. Most children require no active treatment whatsoever. There are no restrictions generally placed on children. Being a child IS the treatment. Allowing the child to pursue normal activity will result in a completely acceptable outcome. 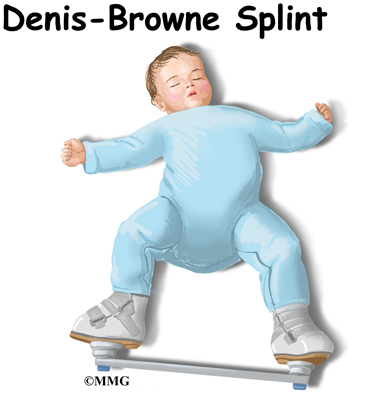 If internal tibial torsion (ITT) lasts 18 months after the start of walking, some doctors will suggest the use of a Denis-Browne splint. A bar is attached to the sole of high-top shoes. The splint is worn at bedtime. The feet are forced into a toeing out position. Some teenagers with exaggerated femoral internal torsion may develop pain in the front of the knee. Physical therapy may be beneficial for the knee pain. Use of ice, heat, taping, strengthening, and gait training may be helpful. Your child's doctor may want you to follow up periodically. This is to make sure the skeleton is developing as expected. Most rotational deformities correct themselves by age eight. Your child will likely be hospitalized for several days after a derotational osteotomy. Because the bone is cut, it may take at least eight to 12 weeks to heal. Your childâs surgeon will want to see your child frequently following surgery. X-rays will need to be repeated. This allows the doctor to evaluate bone healing. If the bone does not heal, further surgery may be necessary. When pins are used to hold the bone in place, cleaning them daily is important. This is to decrease the risk of infection. You will be taught how to do this before leaving the hospital. It is important that you contact your childâs surgeon immediately if you suspect an infection. Your child will most likely need to be in a wheelchair to protect the bone. Physical therapy may be helpful for range of motion of other joints and to maintain strengthening. Unless your child has had a surgical procedure that would allow immediate weight bearing, your child will not be allowed to stand on the leg until after the bone starts to heal. Weight bearing will be increased gradually. Usually by three months, your child will be allowed to walk alone. Walking should eventually appear normal. An occupational therapist may also be helpful during recovery. They will assist with equipment to make dressing, transferring, and bathing easier. They can also help with wheelchair fitting. When the bone has healed, your child may benefit from physical therapy if there is stiffness or weakness that does not get better on its own.